We often talk about the problem Hollywood has with its lack of female directors, female-driven stories on par with that of male-driven stories, and that the big decisions coming from all the major studios are made through the male gaze, which of course has a trickle down effect when it comes to green-lighting films about men, made by men, directed by men and so on. While there is significant change happening the more and more women (and male allies like Paul Feig) speak up about this issue, we firmly believe as a media platform we have a great opportunity to shift the culture of gender bias by promoting the stories and women who are part of the needle-change. 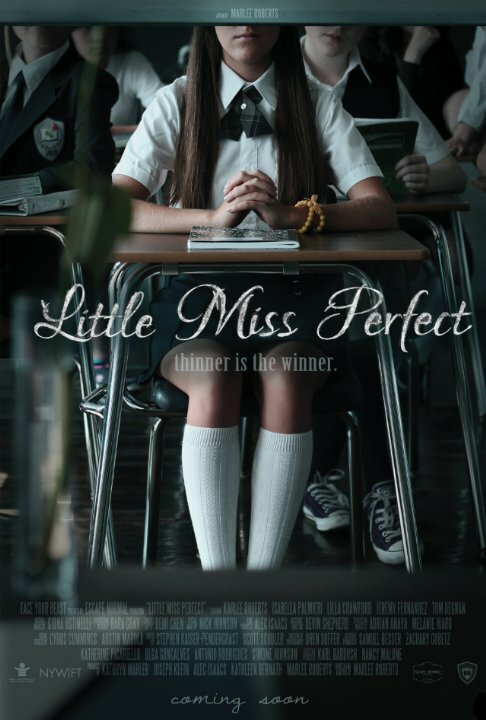 One such indie film is ‘Little Miss Perfect’, written and directed by Marlee Roberts, starring her younger sister Karlee. The film tackles issues such as eating disorders, thinspo culture, addiction, body image, shaming, and the complexities of being a teen girl in a world where appearance is paramount. The film has been screening around the country, and both Marlee and Karlee have been speaking about their experience as young Hollywood filmmakers who are shedding light on the types of issues that is sadly still are not 100% understood by society, especially given the rapidly changing media and digital platforms that play a huge role in the life of teens. We had the opportunity to talk with both of the Roberts’ sisters about eating disorders, social media, female directors in Hollywood, and which classic children’s fairy tale ‘Little Miss Perfect’ is inspired from. How long have you been writing and directing, and what made you want to start? I remember one of my first days as a freshman at NYU film school. All of us film students sat anxiously in a lecture hall excited to learn, to start working on our dreams. Our professor asked us to raise our hands and asked us to think about the kind of filmmaker we wanted to become – a writer, cinematographer, sound designer, director, producer, and so on. He went on to explain that the next four years were going to be invaluable as we would try every aspect of the industry (to gain perspective) and decide what we wanted to pursue. I had starting acting at a young age in NYC. I was fortunate to grow up reading screenplays for auditions so they were always just another form of literature for me. I took a screenwriting class in high school and that’s when I began taking writing more seriously. In college, I honed in on structure. What I would come to realize throughout my college career after sitting in that first lecture hall, was that my personality has an innate directorial tendency. It became a very natural fit and fortunately, I was given an avenue to pursue it. How did the idea for ‘Little Miss Perfect’ come about? ‘Little Miss Perfect’ began first as an adaptation of the traditional French fairy tale ‘La Belle et la Bete’, popularly known in English as “Beauty and the Beast”. The adaptation borrowed Belle’s studious perfectionist nature and combined it with the Beast’s shame and temper. Similar to that of the original story, Belle was given a father who sets off on a work venture, a mother who is out of the picture and a confident bordering-on-arrogant suitor. However, as I continued working on the screenplay, it transformed into its own story and the themes from the classic fairy tale have become only symbols in which we pay homage to the original tale. While not completely autobiographical, I wrote the character of Belle from my personal experience in high school struggling with similar themes I’ve come to realize many girls are facing: social exclusion, academic pressure, body image, and family disconnection. The film aims to tell the story of a girl who struggles to control her life by controlling her weight. This need for “control”, much like our protagonist Belle, had led me to research the psychological and behavioral effects of those who deal with similar issues. I worked with two clinical psychologists specializing in the psychology of eating disorders, particularly in adolescents, and they oversaw the script. I spent about two years writing the screenplay, we shot the film over the following summer and proceeded to post-production thereafter. It’s been a long journey. Can you explain why you drew upon a key aspect of ‘Beauty and the Beast’ story? I thought there was something very beautiful about the duality of making the characters Belle and The Beast one and the same. There are these moments I have sometimes where I catch a glimpse of myself in the mirror and I can’t recognize myself for a moment. It’s fleeting but as I analyzed the feeling in that moment, it fascinated me. I wanted to explore that disparity between our physical and psychological selves and question what that says about us as individuals and as a society. Are we projecting how we feel about ourselves internally so that it reflects how we view ourselves externally? Does our perception of how we look change with how we feel? Even though it’s 2016, there is still a lot of misinformation and lack of education surrounding eating disorders. How do you hope your film will change the conversation? That is so very true. Mental health, as a whole, has been stigmatized to the point where discussion about these issues seems taboo. In turn, this leads to a lot of myths and the dissemination of misinformation regarding really serious subjects like eating disorders. When I was doing research for the film, I remember being appalled to find out (at the time) according to the DSM (Diagnostic and Statistical Manual of Mental Disorders) that to be diagnosed with Anorexia you had to have certain physiological changes to your body, such as three missed menstrual cycles. What I then realized was that girls who haven’t hit puberty yet and men of all ages who were psychologically suffering couldn’t be diagnosed with the disorder at all, which of course is just ludicrous. Fortunately, the criteria has changed a bit in the current manual but there’s still a lot left to re-evaluate, especially in the way we perceive these illnesses in society. 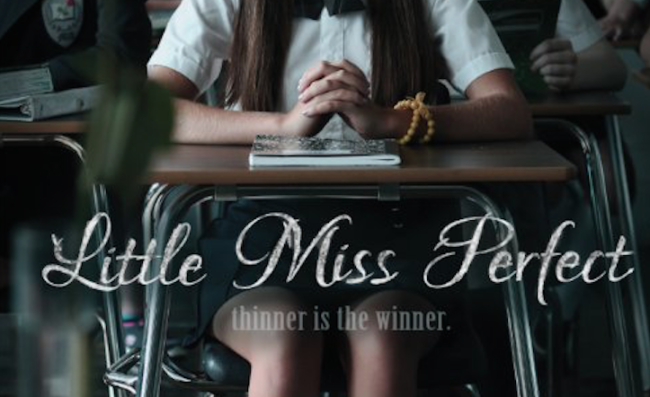 Little Miss Perfect just scratches the surface of some major misconceptions with eating disorders and does so in a way that we hope is subtle and emotionally/ psychologically driven. We aren’t so much focusing on the physical effects of Anorexia as much as we are on the psychological journey of a character seeking control. We worked carefully to craft the story so that the narrative would be engaging and entertaining, relatable to all audiences in that we all seek some way to grasp control over our lives. At the same time, we still wanted to depict an honest representation of the way in which our protagonist goes about doing so. There is a direct focus on “thinspo” sites which have caused a lot of controversy on social media. In some countries like Italy, sites that promote eating disorders are banned. What do you think it will take to dismantle the thinspo trend online? This is difficult. I’ve been receiving backlash already for bringing to light this topic through ‘Little Miss Perfect’. The thing is, eating disorders fuel themselves on isolation and what we’re doing with this film is pulling these sites out of their secrecy and talking about them, which is quite controversial. So the thinspo community may not be very happy at first when they hear about the movie because they are going to feel threatened. They will most likely try to put down anybody who tries to relate to them because they have been so accustomed to the uneducated and ill-informed public making arbitrary comments about their disorder. But their hesitancy is okay, for now, until they watch the movie. There’s a big difference in promoting a serious discussion with a carefully constructed film versus glamorizing the issue by making serious matters the subject of an entertainment piece. Maybe once that is recognized, those in anonymity who have been on those sites will come forward, stand up and help break down the misconceptions. I know that’s hard but that’s all we can hope for. In the US, social networking sites have also recently taken measures to ban thinspo content, like making sure certain hashtags aren’t used, in order to dismantle the cult-like world that has existed for some time now. Still, banning sites isn’t going to solve the whole problem. Taking away the freedom to post things online isn’t going to solve a deeper psychological issue. Obviously the online thinspo communities exist for a reason and that’s because the people on the thinspo sites who are feeling certain ways about themselves and about control don’t see another option. We are failing them as a society because they don’t feel like there is a community elsewhere, a community that understands what they are feeling and supports them in a healthy way. That’s what I saw when I first encountered a thinspo site in high school. But the issue was nobody was talking about it so I had no idea where to turn. I was never diagnosed with an eating disorder but I realized later that I was teetering on the edge. Those thinspo sites were surely triggering, but mostly because I didn’t know what they were and nobody was talking about it. Little Miss Perfect is saying, ‘Hey society, let’s discuss this. Let’s educate people so that if you know somebody who is susceptible, you can recognize it, step in and offer support’. And if you are someone who is a high school teenager stumbling upon these confusing sites, you can put it into an appropriate context, recognize what those feelings are, and find the help necessary. What do you hope viewers will take away from watching ‘Little Miss Perfect’? I hope that audiences watching ‘Little Miss Perfect’ go home learning something about themselves. I don’t want to shove any messages or morals down anyone’s throat and at the same time, I don’t want audiences to leave empty-headed. It’s a balance. I hope the film fosters a dialogue for any of the many themes it presents but more than learning anything, I hope audiences go home feeling like they are good enough. Switching gears a little, as a female director in an industry where women are grossly underrepresented, how do you hope to change the statistics in your career? It is truly shocking to see the statistics and sometimes I don’t think it has fully hit me. A recent study that reflects that the number of female indie filmmakers has remained stagnant... and it’s a sadder case if we start talking about studio movies. However, I do think I have a sort of blind optimism paired with a relentless ambition that leads me to believe anything is possible. I’ve had both wonderful men and women both support me in this industry so I think we are indeed in a changing time where Hollywood is open to the idea of allowing more diversity in leading positions. Still, many projects going into production in the next few years were developed in a time where diversity wasn’t being talked about much so it will take a few years (if we’re lucky) to see diversity pushed through the pipeline. Therefore, I do believe that if we continue to create awareness, we’ll start to see a bigger shift in the years to come. I think the most productive thing I can do now is to continue to prove that women can direct great films, focus on making good movies and make myself visible. I need to do the best job I can so there are no excuses not to hire me. I owe it to my mentors, at the very least, to be prepared to step up and fill the gap now that Hollywood is taking diversity into consideration. What makes the Roberts’ sisters powerful women? I think knowledge is power. I would hope that what gives us power is our ambitious commitment to learning and in turn, educating and empowering audiences through entertainment. Thank you so much for your fantastic really thoughtful questions! Tell us about your character Belle and her struggle with body image and eating disorders? Belle is an overambitious high school freshman. She’s a type-A personality and her school’s class president. As familial, social, and school pressures become overwhelming, she tries controlling her life by the one thing she feels that can control, her weight. She drops down to an unhealthy number and realizes that the very thing she thought she was in control of, is actually taking control over her. How did you get into the mindset of someone who is struggling with these issues? After reading the script and prior to shooting, I looked for characters in other films who adopt some of the key personality traits I found in Belle. For example, Reese Witherspoon’s character in ‘Election’ influenced Belle’s perfectionist nature. Additionally, I looked upon Natalie Portman’s performance in ‘Black Swan’ for the darker aspects of ‘Little Miss Perfect’ when Belle feels a loss of control. In terms of research, I watched numerous documentaries, read many articles about eating disorders, and spoke to some people who have suffered with Anorexia Nervosa. Once it came time to shoot, I let all of this prep work sit in my subconscious. It was in the back of my head if I needed to pull from it, but I let go during each take and let my performance be spontaneous. The most crucial part during filming was being in the moment and drawing my personal life experiences to Belle to make her as relate-able and three dimensional as possible. I remember one day on set, we were shooting psychologically-driven intense scenes all day. We were on the last shot of a long day and I felt as if I couldn’t get it right. I was trying so hard to deliver the best performance and it just wasn’t happening. I remember Marlee telling me that’s how exactly Belle feels in this moment. No matter how hard she tried, she couldn’t get it right. She felt disappointed in herself and a disappointment to others. We shot the scene again and that’s all we needed. Finding the parts of myself that most relate to a character adds a sort of realness and depth to get into her mindset. What was it like to work with your sister on this film? Working with my sister was an amazing experience. She understood my working process and what my needs were to achieve the best performance I could deliver in a scene. We kept it very professional on set. Most people didn’t realize we were sisters until the last day on set! I mean, she did still make me audition in front of casting and producers. What has been the reaction from audiences as you have screen the film at various events? I’ve watched the film so many times, that now during film screenings, I just like sit back and watch the audience’s reactions. Some audiences trickle in uncomfortable laughter while others gasp at intense moments. And then there are certain beats in the film that always trigger a major audience reaction. The feedback has been extremely positive from viewers! Showings at the Irvine International Film Festival and Annapolis Film Festival were sold out and the audience consisted of a wide range of demographics. Many audience members, who may have not necessarily suffered from eating disorders have put themselves in Belle’s shoes with their own individual struggles from the pressures they felt in society. It’s also been extremely rewarding to have some audience members who have suffered with eating disorders come up to us and let us know that we have accurately portrayed Anorexia Nervosa and they appreciate that we’ve accurately captured the psychological aspects of the disorder. What is something about addiction that you want people to know about after watching the film? While eating disorders aren’t necessarily addictions, they have very similar qualities and certain behavior may be categorized as “addictive”. I suppose the most important lesson I’ve learned and that I’d like to share about mental illness, addiction, or any other vice that stems from wanting to be in control, is that it happens to anyone, effecting people of all demographics. Although we tell the story of an upper-class white female who is struggling with an eating disorder, they are NOT the only demographic who can suffer from the disorder. This is just one story. Since playing Belle, what have you personally learned about the depth of suffering with an eating disorder that you want to share with more people? I hope audiences understand that we all have some sort of insecurity that sometimes overwhelms us and inhibits us to be our full wonderful selves. We have to face this beast. Our beast is the highest unobtainable version of our idealized self. This haunting beast we construct in our minds can be so powerful that we physically and emotionally believe we aren’t that “perfect” person. And we will keep taking it out on ourselves until we realize that the beast will always be there and the best thing we can do is accept it and learn how to live with it. I hope viewers understand that for Belle and many other girls whose “beasts” might be related to body image or eating disorders, it’s not just about being thin, it’s much more complex and psychological in nature. Tell us about the #FaceYourBeast campaign which was launched to build on the message of the film? The goal of #FaceYourBeast campaign is to identify our internal struggles and try to overcome them, to raise awareness that everyone is facing some kind of issue and whatever that issue may be, nobody is alone. I think what makes us powerful women is our drive. We create opportunities, rather than wait for them. To find out more about ‘Little Miss Perfect’, click here.